UDegrease is a powerful degreasing agent that is useful in preparing an entire area for a UCoat floor coating system. Simply dilute with water to the desired strength, apply to the floor, thoroughly agitate with a broom, and rinse completely. 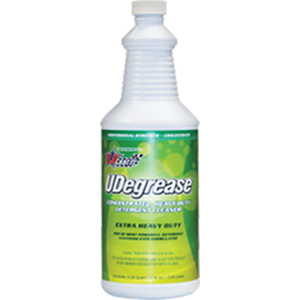 UDegrease can also be used to remove some waxy residues left behind by water-washable paint strippers after removing an old coating or paint.